Anybody want to buy a house in Norfolk? From my own humble experience, it would seem the answer is NO. 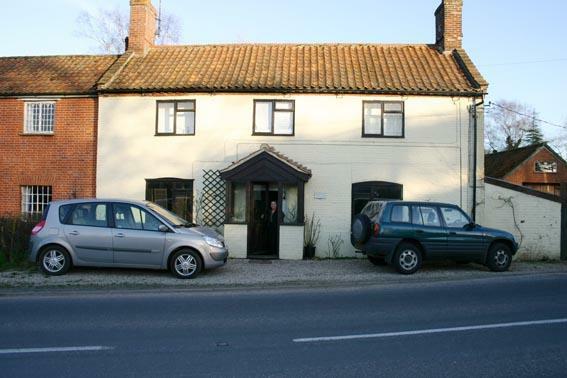 I have been trying to sell this fine-looking former pub complete with a detached studio, in the village of East Bilney, for 12 months now and despite several price cuts and masses of viewings, and no less than four “Sale Agreeds,” it remains unsold. In fact it starts life with a new agent, Belton Duffy, from the start of this coming week. The most recent sale agreed has fallen through because our buyer has lost his buyer. Again. This particular buyer is now responsible for two of the four failed sales and he may yet make it across the finishing line to become the proud owner of Swanhaven. But he is moving from a smaller house which is (or should be) attractive to first-time buyers and, as everybody keeps telling us, first-time buyers are thin on the ground at the moment. Ten days ago, our now ex-agent rang to say he was “very confident” that our buyer had landed a good first-time buyer and that our deal was back on again. He added that he just had to run through some credit checks on the first-time buyer, what he referred to as a “qualification procedure.” He was awaiting an accountant’s report and the accountant was away on holiday. So far, so Norfolk. This week, the accountant’s report turns up, the young man comes in for his qualification meeting, he passes with flying colours, the deal is on, the chain is live. Closing the deal is the very stuff that estate agents live for and I can’t help but get caught up with his enthusiasm, especially as this deal has taken so long and proved to be so problematic. Time to pop open the champagne? Not quite. The next morning, the young man has “reconsidered.” He is just off on two weeks holiday and he wants to “think about it.” Yeah, whatever. Exasperated? You bet. Angry? Not really. Stoical is the word for how I feel about it all now. This morning as I lay in bed I started thinking about this young man, our abortive first-time buyer, and I put myself in his shoes. As a first-time buyer, he would be having to borrow maybe 95% of the £115k asking price. Whilst he would probably be delighted to know that he qualified and that his credit ratings all stacked up, I can quite understand anyone who might just feel a little reticent about getting into so much debt. Taking on a mortgage for a first-time is a defining point in many people’s lives, not quite up there with becoming a parent or getting married, but not far short either. Now in a booming house market, the attractions of a 95% mortgage are obvious: because of the gearing effect, your equity increases no less than twenty times faster than the house price. You only need house prices to increase by 5% per annum, and your equity doubles in Year One. But in a stagnant house market, there is little, if any, advantage in taking out a large mortgage, as opposed to renting. And, of course, in a falling market, which Norfolk has been for the past 12 months, anyone with a large mortgage is losing twice over. So yes, I can understand this guy’s reticence to become a player in the Norfolk housing market. No doubt our little drama is being replicated tens of thousands of times across the country. It’s hard not to extrapolate, to read this young man’s behaviour as a proxy for the whole housing market, at least as far as first-time buyers are concerned. The agents will be trying to figure out where the price point is which switches his behaviour from sniffing around to actually closing the deal. But from his point of view, a mortgage is a mortgage and whether it’s £105k or £95k or even £60k, it’s still a huge amount of money and it’s really only an attractive option for him if taking on this mortgage brings wealth along with it, and the only mechanism that delivers that is rising house prices. Viewed from this perspective, it’s easy to grasp just why the housing market tends to overshoot on the way up and on the way down as well. It’s why the economists fabled “soft landings” so very rarely happen. It doesn’t bode well for the next couple of years, does it? So go and enjoy your holiday, unknown first-time non-buyer. I have a sneaking admiration for you and I suspect you may well have made the right decision. Meanwhile, anybody want to buy a house in Norfolk? What’s Belgium got to teach us about housebuilding? The big question is this. Can the cost savings shown by Danilith be achieved simply by copying the technology or is the different business culture an essential part of the mix? Whilst it ought to be easy to introduce robot bricklayers, it will be much harder to integrate the Continental work ethic needed to keep the robots ticking over. Sasmox is distributed by the Panel Agency www.panelagency.co.uk, Tel 01474 872578. The contact is Roger Kingsley who is happy to deal with largish (whole house) orders direct. 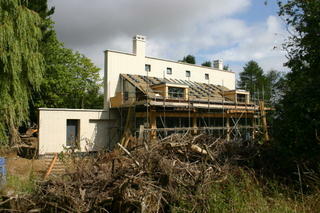 Friday morning, drive down to Thaxted to see how David Birkbeck’s new house is coming along. David was the first editor to hire my keyboard, back in 1996, and now he runs a consultancy called Design For Homes which sets out to get housebuilders to hire architects. He is in the middle of his first selfbuild and I have been following the story ever since he first put an offer in on the plot. The house is, naturally, very designey: the architects are Snell David. I was last here in January when the extraordinary spine wall was taking shape with these unusual blocks, which are glue-mortared. If settlements are added to the ‘sundry’ component (largely transport infrastructure such as roads and railways), then built-up Great Britain consists of about 2.3m hectares, or just 10 per cent of the land available. Clearly, considerable growth in both population and household numbers can be accommodated – both in high urban concentrations, and as dispersed settlements integrated into the landscape. This takeover bid for BBP set me thinking about what has become of all the businesses and brand names that once supplied the UK housebuilding industry. Here follows a far from complete list of “where they are now.” The heavy side has almost all gone overseas; the only big local player left is Hanson, which makes it an attractive target for other would-be empire builders. It’s ironic that Hanson Trust, as it then was, started a lot of this consolidation process back in the 70s and 80s, only to be hammered for it by the City when it went out of fashion in the 90s. Celcon: Owned by H+H International A/S, a Danish company. Baggeridge Brick: an independent brick manufacturer, quoted on the London Stock Exchange (LSE) till August 2006. Then it was taken over by the acquisitive Austrian group Wienerberger for £89m. Two years previously, Wienerberger had bought thebricksbusiness for £100m. 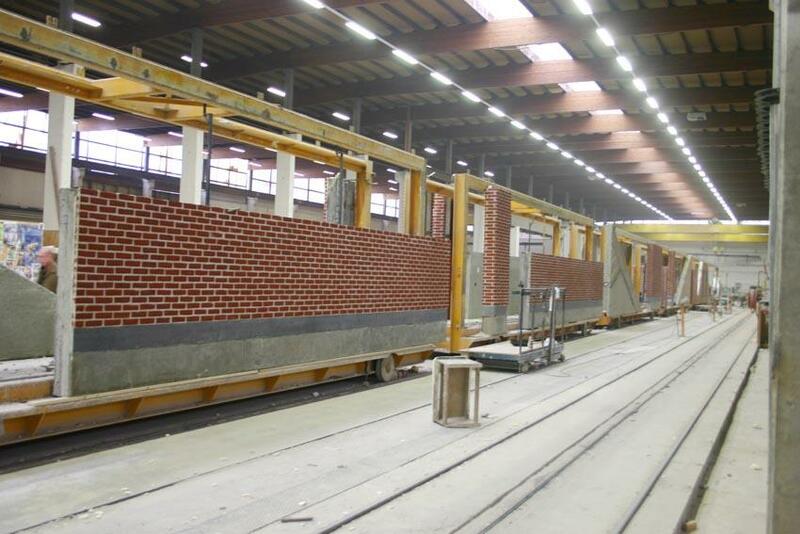 The 2006 acquisition lifts Wienerberger to No 3 in the UK brick market at around 24%. Hanson is No 1 at 33%, CRH is No2 at 30%. Osma: always owned by Dutch group Wavin. Wavin is short for WAter and VINyl! Used to be part owned by Shell but I now jointly owned by Overijssel Water Board (who started it in the 1950s) and CVC Capital Partners, private equity. Marshalls: independent, quoted on LSE. Yesterday, the French building materials conglomerate, St Gobain, put in a hostile bid for BPB, our principal plaster and plasterboard manufacturer. After two friendly offers were rejected, they have now gone hostile at 720p a share. But the institutions want 750p, maybe even 800p and won’t accept the St Gobain offer as it stands. Before all this takeover kafuffle started, BPB shares were trading at around £5 and had, in truth, been a very unremarkable investment over the years. BPB turns over just over £2 billion a year which, coincidentally, was roughly its market capitalisation before St Gobain appeared over the horizon. It’s expected to make a profit of around £250 million this past year, that’s 36p per share, and it pays roughly half of this out as dividend. At £5, BPB was priced at around 14 times annual earnings, roughly in line with the sector: at £8, this ratio goes up to 22 times which, as far as the City is concerned, is off the top of the scale. So why do the French seem so keen on buying yet another piece of the UK building supplies industry? Would you pay £300,000 for a house which was reckoned to be worth £200,000 just a few weeks ago? It appears that St Gobain are prepared to. What is it that attracts St Gobain so much? BPB is not just “another house.” For one thing, it retains the exclusive rights to mine gypsum in the UK and whilst mined gypsum is not exactly a priceless commodity, it’s been incredibly helpful to BPB over the years in keeping rivals at bay. Most mined British gypsum is pink: the pink colour is actually an impurity but it’s become so accepted that when the other two European manufacturers, the German privately-owned Knauf and the French conglomerate Lafarge, wish to sell gypsum plasters into the UK, not only do they have to ship the stuff across the Channel but they have to die it pink as well, otherwise British plasterers won’t accept it. In fact BPB used to be known as British Gypsum. It began life in 1917 and it was only in the 1990s that it changed its name to BPB (British PlasterBoard) to reflect the fact that boards were now the main part of the business, plus the fact that it was by then an international trading company and far from exclusively British. Plasterboard was originally invented in America in 1916 by the US Gypsum Company: they called it Sheetrock and they tried for years to get builders interested in their innovation but to little avail. It was the need to reduce construction manpower in World War 2 which eventually caused Sheetrock to take off. It did away with the need for wood lath, multiple plaster coats, and days and days of drying time — hence its American generic name, drywall. 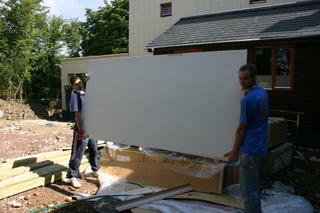 In Britain, we have always referred to it as plasterboard. Installation was simple: the sheets were nailed up, the nail holes were filled, paper tape was used to cover the joints, and a textured coating was trowelled on to help disguise the defects. Voila, as the directors of St Gobain might say. In Britain, the take-up of these boards was similarly slow. British Gypsum plugged away throughout the 50s and 60s trying to get builders to accept this modern method of construction but, because the bulk of our housing is masonry, most builders still preferred to use wet plaster. It didn’t matter a great deal as the company had a monopoly on all gypsum products, whether bagged plasters or boards. But the monopoly was to go in the 1980s as both Knauf and Lafarge entered the UK market. Whereas initially, British Gypsum sold plasterboard to builders as time-saving innovation (really an excuse to charge more money), plasterboard then became one of the ultimate commodity products. Its price has remained largely unchanged for twenty years. But the manufacturers countered this by making plasterboard with less gypsum and more air, thus reducing their costs. Whilst this kept British Gypsum’s bottom line ticking over, it did very little for the acoustic properties of British housing. BPB, as it now is, used this as a marketing ploy and, when the sound regs were beefed up in 2003, they “introduced” a new board called TenBoard, specifically to meet the new requirements. Why the name? The "ten" refers to the weights of the board per square metre — i.e. 10kg. Ironically, back it in the 60s and 70s, all plasterboard weighed this much! Ninety years after its invention, the market for plasterboards is still growing and looks set to continue to grow. Although I am not a great fan of our government’s push to get everyone and their aunt to embrace Modern Methods of Construction, the truth is that they are pushing against an open door and housebuilding is going that way, whether we like it or not. One of the key difference between modern methods and old-fashioned ones is the presence or absence of water during the building process — modern methods are almost always dry methods — and plasterboard, in its many forms, is always going to form a part of any MMC construction system. That, I guess, is St Gobain’s reasoning. Whilst the City looks at valuation in comparison with similar businesses, St Gobain are empire building and are all about fitting bits of the jigsaw into place. 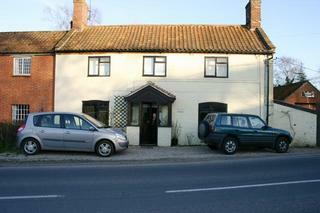 To them, this house may well be worth £300,000 because owing it unlocks value elsewhere. Whether it succeeds in making a sensible business is another story but at heart we have another classic encounter between the Anglo-Saxon model — everything’s for sale, at the right price —and state capitalism as practiced by the French. Whilst the French seem slowly to be hoovering up our utilities and our manufacturing base, we Brits are spending the proceeds on French property. The Independent doesn’t share my scruples. 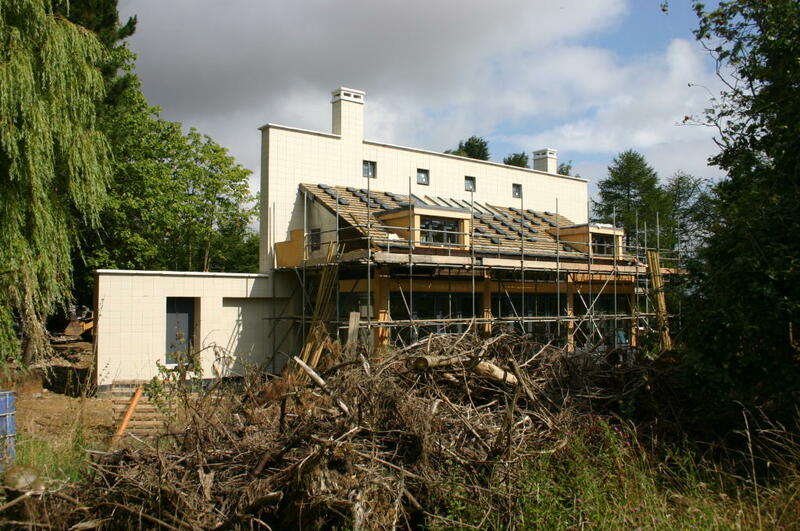 They are currently running a weekly column (Wednesday, Property) called Diary of an Eco Builder, penned by Will Anderson who is building a large new timber-framed house in South London and is writing about his experiences. Today’s column (3 August) is interesting because it deals with one of my pet subjects, moisture management. It’s a much misunderstood subject and Anderson perpetuates many of the misunderstandings. Myth No 1: “Our walls must obviously be robust enough to stop water getting in” writes Will, “but this is a simple task compared with dealing with moisture going the other way.” Anderson might think keeping rainwater out of the house is a simple matter but despite thousands of years trying, we still haven’t mastered it. The huge bulk of problems we experience with both roofs and walls stem not from anything weird happening with water vapour, but from rainwater ingress. Myth No 2: “The principal movement of moisture within walls is from the warm, humid interior to the cooler, drier exterior.” What he is referring to here is the phenomenon of vapour diffusion, which occurs at molecular level. Water vapour will tend to travel, albeit very slowly, from areas of high vapour pressure (i.e. indoors) to low ones (i.e. outdoors). That’s the perceived wisdom on walls, and has been since the 1940s. Unfortunately, more recent research has shown it to be largely irrelevant. There are far more important drivers governing the behaviour of moisture in walls, floors and roofs. Myth No 3: “We generate huge amounts of water vapour in our homes, cooking, bathing, washing and breathing.” My quibble is with the use of the word “huge” in this context. A person living in a house produces about 1 tonne of water vapour a year: on its own that sounds like an enormous, or even a “huge” amount, but set it in context. 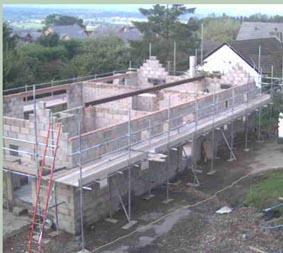 A detached house weighs around 100 tonnes and as much as 10% of this is made up of water, bound in with the building materials. This water:solids ratio is not a steady state relationship; it’s in a constant state of flux, depending on conditions both indoors and outside. Odd litres here and there produced by the occupants – a tonne a year approximates to around 3 litres a day — hardly makes any difference to the overall behaviour of moisture within the house. Myth No 4: “Condensation occurs whenever air cannot hold any more water.” I am indebted to William Rose’s excellent new book, Water in Buildings — an Architect’s Guide to Moisture and Mold* — for nailing this one. Condensation occurs when there is a suitably shiny, non-porous surface and the temperature is below somewhere around 12°C, but it doesn’t follow that condensation always forms whenever the air isn’t warm enough to hold the water vapour. The excess moisture is frequently taken up by the materials in the room without classic condensation taking place: carpet is very good at it, so is painted plasterboard and unsealed timber. Anderson finishes his article by running through his spec for his walls: he appears to be installing a heavy duty vapour barrier (the key weapon in the fight against condensation, according to the profile method) and a “breathing wall” routine as well, using Warmcel, the recycled newspaper insulation which sells itself as a natural alternative to plastic vapour barriers. I have never heard of anyone doing this before: it’s either plastic vapour barrier or breathing wall, not both combined. I would have serious reservations about Will Anderson’s design: the whole point about breathing walls is that they are designed to dry both outwards and inwards: placing a plastic vapour barrier inside his Warmcel may stop this happening. Heavens, it may even lead to the very thing he is trying so hard to prevent. Might our Eco-Builder be in the process of constructing one very soggy house?